Places that are tough to get to. Those are the places that Dr. Alexander Kholodov and Dr. Santosh Panda seek out. As researchers from the Permafrost Laboratory at the University of Alaska Fairbanks Geophysical Institute, Dr. Kholodov (PI) and Dr. Panda work in some of the most difficult to access rural communities in the Alaskan interior. Passionate about community-science partnerships, the team engages indigenous Alaskans in meaningful contemporary research that directly relates to their day-to-day subsistence lifestyles. This mutually beneficial partnership allows traditionally under-served tribal communities the opportunity to benefit from modern scientific techniques to assess and respond to changing environmental conditions, particularly relevant as climate change impacts near-surface soil temperatures and permafrost. Rural communities – empowered with modern scientific knowledge and tools – are able to adaptively manage subsistence resources, implement safe land use practices, and plan for the future as climate change becomes increasingly impactful. Funded by the National Science Foundation (NSF) and supported by Polar Field Services, Inc. (PFS), Dr. Kholodov and Dr. Panda are now in the third year of their partnership with rural communities in the Upper Kuskokwim region. With generations of observations and indigenous knowledge critical to a subsistence lifestyle, participants from remote villages are able to integrate their knowledge with networks of soil temperature sensors and scientific interpretation of temperature data. As part of the partnership, Dr. Kholodov and Dr. Panda work closely with the communities of Nikolai and Telida Village, isolated villages with fewer than 100 inhabitants. Far removed from the Alaskan road system, a major barrier to conducting work in these locations is access. When asked about their experience accessing the Upper Kuskokwim region, Dr. Kholodov was quick to describe “... horrible logistical access – very difficult – we wouldn’t be able to do work there without PFS.” Providing fixed-wing aircraft charter support, PFS makes it possible for Dr. Kholodov and Dr. Panda to get where they need to go. Map of Alaska showing rural villages of Nikolai and Telida Village, where Dr. Kholodov and Dr. Panda work with indigenous communities to conduct environmental measurements. Image credit: Telida Village Council. 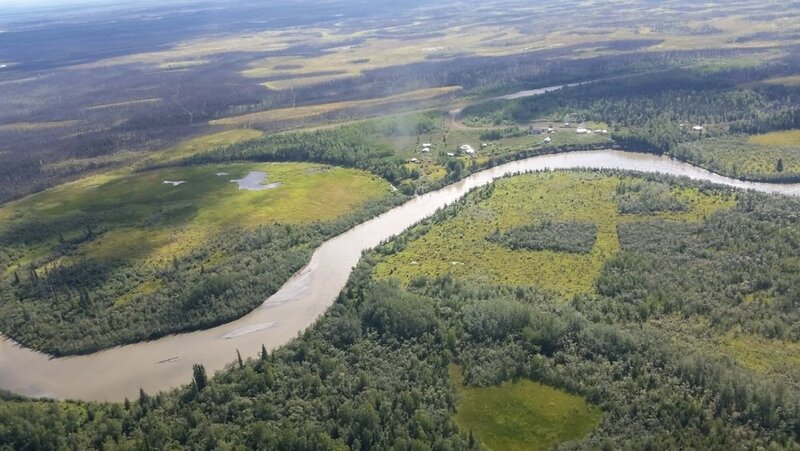 Aerial view of the Upper Kuskokwim River, with the community of Telida Village visible in the distance. Photo credit: Permafrost Laboratory. Passionate about their work, Dr. Kholodov and Dr. Panda eagerly describe their goals for the multi-year village partnership. “Our first priority is to understand people’s needs and concerns in small communities that rely on subsistence resources,” says Dr. Kholodov. By engaging community partners in permafrost and climate change research, participants will improve their ability to adapt and plan for environmental changes ahead, and learn basic scientific skills that may lead to job opportunities. 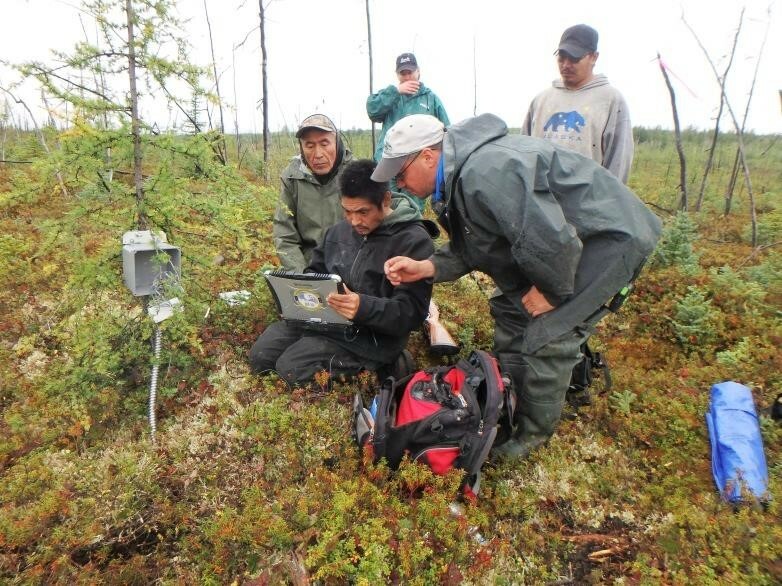 Working closely with local partners, the team conducts near-surface permafrost mapping and modelling using a network of temperature sensors. With the Arctic at the forefront of climate change, subsistence communities are highly sensitive and vulnerable to environmental changes that are underway. Many community members are acutely aware of these changes. From surveys conducted in Telida Village, inhabitants reported personal observations including, warmer winters, lack of snow, ice condition changes, variable rain patterns, more bugs, declining berry production and bird activity, river erosion, and development of sink holes. By integrating modern sensor measurements with rich indigenous knowledge, communities gain credibility and strengthen their voice to help inform decision-making. Benefitting from the community-science model, indigenous inhabitants learn technical skills to acquire, analyze, and interpret scientific data, which is used to monitor changes in near-by frozen soil and permafrost that have direct impact on their homes, livelihoods, and lifestyles. Dr. Kholodov notes, that “…people can see the changes going on”, and Dr. Panda comments that “…people are concerned and interested about what will happen to infrastructure.” When ground ice melts, the water table shifts and once stable ground become uneven, unpredictable, and difficult to build on. The fate of existing structures – and planning for new construction – becomes uncertain. Before conducting field measurements, Dr. Kholodov and Dr. Panda worked closely with local partners to plan activities, identify sites for surveys and sensor installation, and discuss site accessibility. Hands-on training was provided for sensor installation, maintenance, and data retrieval. Participants from Telida Village – including a local senior high school student – learned how to conduct winter snow surveys and operate a gas powered coring device to collect frozen soil cores. Telida Village residents work in partnership with Dr. Kholodov and Dr. Panda to plan and conduct field measurements to better understand changing temperature, ground ice, and permafrost conditions, including winter collection of frozen soil cores. Photo credits: Permafrost Laboratory. Following installation of a soil temperature data logger near Telida Village, community partners get hands-on training from Dr. Kholodov. Photo credit: Permafrost Laboratory. Progress and data analysis results are communicated to village residents through multiple forums including Community Open House, school engagement, and interactive displays. An Open House organized at the Nikolai City Hall included display of three-dimensional permafrost landscape models, posters on permafrost, maps, ice age mega fauna bones, permafrost soil samples, and demonstrations on field sensors and building practices on permafrost-affected land. 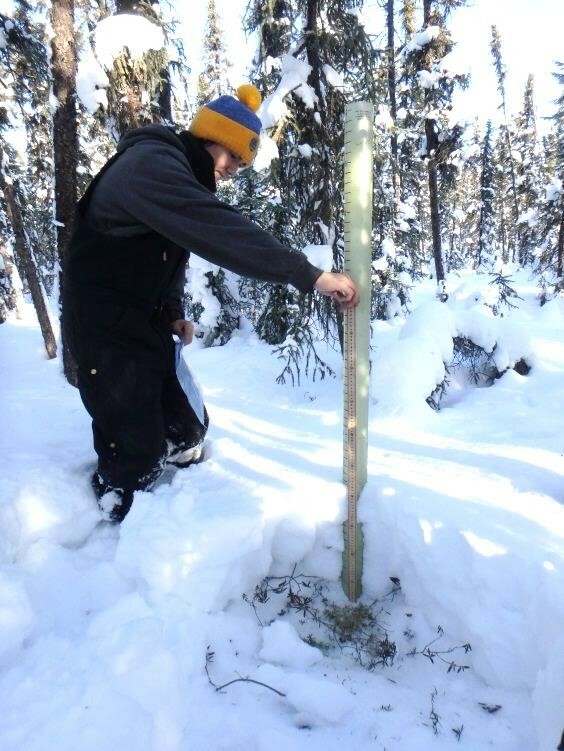 Engagement at local schools has included discussion of permafrost and ground temperature changes occurring locally, and monitoring stations with temperature sensors were installed near schools to facilitate ongoing learning. Outreach and communication with indigenous communities is critical to the long-term understanding and engagement necessary for adaptation to climate change. Interested in learning more? 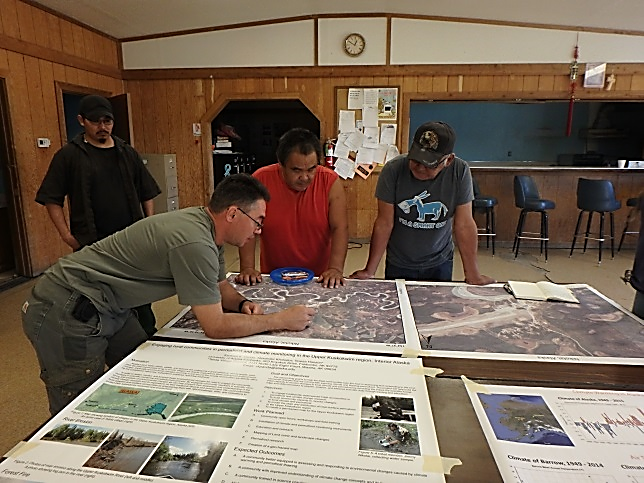 As the communities of Nikolai, Telida Village, and Kotzebue continue to collect field measurements, Dr. Kholodov and Dr. Panda work with local partners to interpret and analyze data. Follow the results of their analyses, and learn more about their work at the University of Alaska Fairbanks Geophysical Institute Permafrost Laboratory: www.tinyurl.com/community-permafrost.